View Image Gallery of Tribe Arctornithini n.
Arctornis submarginata Walker comb. n.
Redoa submarginata Walker, 1855, List Specimens lepid. Insects Colln Br. Mus., 4: 826. Diagnosis. The wings are a dull satiny white, the forewing with a small black discal spot. The head has two blackish brown bars on the frons between the antennal bases and dorsal part of the eyes that blur into each other. The palps are basally and internally ochreous but grade blackish towards the apex. The legs are spotted black in the usual places. The male genitalia have the uncus well developed, tongue-like. The harpe has its apex diagnostically asymmetrically expanded as illustrated. Taxonomic notes. The only syntype male located (Silhet), has lost its abdomen but has facies as above. Identity here is made with reference to a male from Darjeeling (slide 2127) labelled by W.H.T. Tams as 'The true Leucoma submarginata Walker'. The whereabouts of the other four syntypes (Silhet, E. Indies, Ceylon) is unknown. 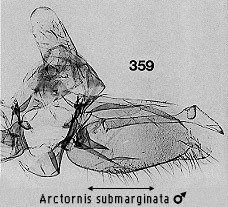 The taxon transiens Walker, Treated currently as a synonym of submarginata, was purportedly described from a Sarawak male collected by A.R. Wallace. The specimen labelled as type in BMNH, though also collected by Wallace, is labelled with his original label as being from the Aru Is. The genitalia (slide 2766) do not match those of any Bornean species, though indicate a relationship with A. clavimicruncus sp. n. and allies (See A clavimicruncus sp.n). It is possible, therefore, that this specimen has been incorrectly identified as the type of transiens, or, as suggested by Collenette (1932: 52), the Aru specimen was inadvertently mixed in with the Sarawak material Walker was studying. It is best treated as Arctornis transiens Walker stat. rev. & comb. n. with Aru regarded tentatively as type locality. Geographical range. N.E. Himalaya, Borneo, Sumatra (Schintlmeister, 1994). Habitat preference. Only three specimens have been taken in Borneo, one from lowland forest at 100m in the Ulu Temburong of Brunei and two from stunted hill forest at 900m on Bukit Monkobo, Sabah.